The mouth plays a critical role in digestion. Proper chewing and a complete bite are crucial in this process. Imagine ... you are enjoying a meal. You start by taking a bite of food. Yum! The flavors ignite the salivary glands. The saliva starts flowing. You begin enjoying all the delicious flavors. The teeth are chewing in order to break down the food into smaller and smaller bits. The tongue moves the food around the mouth to make sure it is getting properly tasted and broken down. The saliva encases the food and its enzymes break it down further. By the time you are ready to swallow the bolus of food is nicely mashed and easily goes down the throat toward the stomach. This happens each time you take a bite of food. Now imagine that you are missing several (or even a few) teeth. You take a bite of food but it is harder to grind that food up. When you swallow there are larger chunks of food present in the bolus that is heading toward the stomach. The stomach has to work harder to break down this mixture. You may notice stomach discomfort after eating or an increase in acid reflux. This also happens when you don't properly chew the food (like inhaling it instead of enjoying it). If you are missing teeth contact your dental professional to see what options you have to correct this. Also make sure to chew your food completely to help with the digestive process. Invisalign is an orthodontic treatment option that allows people to straighten their teeth using clear trays, called aligners. These trays are made with a trademarked SmartTrack material that gently guides the teeth into the desired position. Tooth movement is also aided by composite attachments that are temporarily bonded to certain teeth depending on the movements needed. These attachments are the same color as the teeth and are hardly noticeable. Invisalign trays are worn twenty-two hours per day and are removed when eating. Each tray is worn up to two weeks and then changed for a new one. Invisalign trays are removable and allow easier home care (brushing and flossing) than traditional braces. While this is a major benefit it can also be a hindrance. 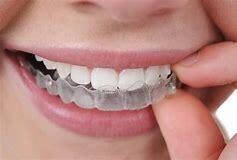 Compliance and wearing the trays is a must if Invisalign is to work. If you don't wear the trays the teeth are not going to move. Invisalign is a great choice for adults and very compliant teenagers. There are definite benefits to having straight teeth. Straight teeth are more esthetically pleasing. An aligned bite is more conducive to a healthy mouth. When the teeth are straight, it allows for easier brushing and flossing. Easier oral hygiene diminishes plaque and calculus build up on the teeth leaving the gums and teeth happier. Tooth decay is the most prevalent chronic disease in both children and adults. The good news is that it can be preventable. Knowing what causes tooth decay, aids in its prevention. Three components are necessary for a cavity to happen. These include: bacteria, food for the bacteria and a tooth. If any of these criteria are missing, decay will not happen. The most common bacteria associated with tooth decay are streptococcus mutans. These bacteria use the sugars found on teeth to create lactic acid which breaks down the enamel. The enamel is the inert, protective coating on the outside of our teeth that preserves the soft inner layers. If it is weakened, the tooth is more susceptible to damage and decay. The food we eat can provide a meal for the bacteria on our teeth. Foods that are high in sugar or those that can be converted into sugar are what the streptococcus mutans thrive on. Their meal is changed into an acid that erodes the teeth. Finally, the tooth is the setting where this process occurs. To prevent decay, it is very important to brush or rinse the food items from the teeth after eating. Limit the amount of sugary food or items that will turn into sugar (ex, crackers, chips, cereal ...). Good oral hygiene habits and a well balanced diet will help deter tooth decay. Do you have consistent pain in your tooth when you are biting or chewing? The culprit may be cracked tooth syndrome. This occurs when there is a crack in the tooth. In many cases this crack is too small to show up on radiographs or is under the gingiva. Cracked tooth syndrome can be difficult to properly identify. Signs and symptoms of a cracked tooth are pain upon biting or discomfort to temperatures like hot and cold. The discomfort lasts while the tooth is in use. Some common causes for cracked teeth include: grinding or clenching, malocclusion of the teeth (improper bite), and large restorations in the teeth. Some treatment options for a cracked tooth include: bonding the affected tooth with composite, a full coverage restoration of the tooth (an onlay or crown), root canal therapy, and in severe cases extraction of the tooth. If you feel like you may be clenching or grinding your teeth, especially at night, talk to your dentist about a night guard. This guard will help protect your teeth. Also if you have malocclusion, talk to your dentist about orthodontics (braces). A good bite creates a healthy environment for the mouth.